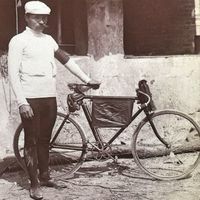 Raleigh is one of the oldest bike makers in the world, starting life in 1887 when Sir Frank Bowden purchased an interest in a small bicycle company on Raleigh Street, Nottingham. Taking its name from the street, the ‚Raleigh Bicycle Company‘ was formed in 1890. It remains the most popular bike brand in the UK, where Raleigh is also responsible for Diamondback BMX and mountain bikes. During the first half of the 20th century, Raleigh took control of some of cycling’s most iconic names, including Sturmey Archer, Phillips, Hercules, Norman and Sun, and by 1960 it had become the world’s largest producer of two wheeled personal transport. The famous Raleigh Heron head badge can now be seen in well over 100 countries around the world. Among hundreds of models, the company is particularly famous for its classic children’s bikes. The Chopper, with its large back wheel and small front wheel, and its angular, aggressive-looking seat, was an enormous success in Britain and America, and was relaunched in 2004, 34 years after it originally hit the streets. 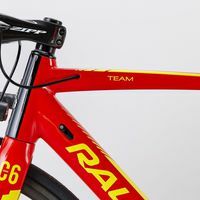 Over the years, Raleigh has worked with some of the world’s most talented professional riders including Laurent Fignon, Nicole Cooke, Lizzie Armitstead and Joop Zoetemelk, who won the 1980 Tour de France riding for the TI Raleigh Creda team. 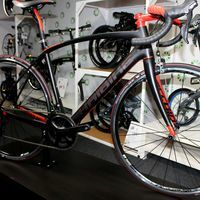 Following the reformation of its elite racing squad in 2010, Team Raleigh riders won the UK Tour Series sprints jersey competition in 2012 and 2013, and picked up notable wins in the Welsh National Road Race Championship and the British National Hill Climb Championship.